Third Division Oxford United are showing further interest in Phil Parkinson. The ever-popular Reading midfielder has been linked with United before and the rumour follows Parkinson's lack of first team action this season. Parkinson has made just the one start - in the league cup - and has been restricted to a number of late appearances from the bench in the league. Although it's possible that Oxford may well be interested in the player, a full move seems extremely unlikely with Parkinson looking to start a coaching career at Reading at the end of this season. A loan at some point isn't entirely out of the question, but Parkinson may prefer to stay around at Reading with his ever increasing involvement in the reserve side as the season continues. Have you got hold of your free Hob Nob Car Sticker yet? There's plenty of car stickers still available - and they're free when you send in a stamped addressed envelope. The latest sticker features a rather pleasant Biscuitmen design, and would like great in the back of any loyal Royal's car. To find out more please follow the link below. FREE HNA? Car Sticker - Available Now! Congratulations to George Town and "Slap" who currently lead the Hob Nob Anyone? Prediction League in the total points and average points tables respectively. If you are yet to enter this season then follow the link below to start entering your predictions - you need to predict a minimum of ten matches during the season to be in with a chance of winning the average points prize. The HNA? Prediction League is the original Reading FC Prediction League - running since 1995 - accept no dodgy broadcasting company imitations!! Reading stayed eleventh in the table this weekend, after missing out on a home win against Stoke City at the Madejski Stadium. A decent home crowd of approaching fourteen thousand saw Reading have most of the game in a mid-table Division One encounter - but fail to take the full three points which they probably deserved. A rare Anthony Rougier goal after eleven minutes saw Reading take the lead. Rougier's fourth Reading goal in approximately 80 appearances was an excellent strike from the right side of the area after a cross from the left. Reading continued to have most of the game, until a freak Stoke City goal made it 1-1 with six minutes of the first half left to play. A Stoke shot, or perhaps cross, was running well wide of goal before it took a cruel deflection off Adrian Williams and found it's way into the unguarded area of the net. Despite enjoying the majority of the play in the second half, the Royals were unable to regain the lead and were forced to settle for a point. Andy Hughes provided Reading's greatest moment of the season so far with a superb strike at Molinuex on Saturday. The goal, roughly on the hour mark, was enough to provide Reading with a suprise 1-0 away victory at Wolves. Reading bounced back from their 0-2 home defeat against Norwich to go eleventh in the table, and above Wolves, using the same formation - but playing it with some style and plenty of composure. Reading looked the more comfortable of the two sides throughout the ninety minutes and deserved the victory for a solid all round team performance, against a Wolves side that rarely troubled the Reading defence. Hughes goal was probably goal of the season - a scorching shot from not far inside the Wolves half that flew into the back of the net. It was a great day out for the travelling fans who made plenty of noise in the sun - at the final whistle the players and Alan Pardew were clearly just as pleased. This was a great day for the club all round. Reading suffered their third straight defeat tonight at home against Norwich City in the League - and it was all over in the opening five minutes. Despite a bright opening few minutes, Reading went a goal down after just three minutes when Mackie missed a cross allowing a simple tap in from a few yards out in the middle. It was 0-2 a few minutes later when the ball was played in from the other side and converted from the middle of the area. Reading's experiment with three defenders and a five man midfield seemed to cause confusion throughout the side as Norwich cruised through the fixture. John Mackie was dismissed for a second yellow card with five minutes of the first half remaining, and it was all over with a whole half still left to play. Reading had a lot of the ball in the second half but could do nothing with it against a Norwich side that defended with ease with the extra man. In a game that was never allowed to entertain thanks to a poor performance from the referee, Reading were well beaten by a side a class above. The second half saw another show of effort throughout the side - but we were never close to turning the game around. Reading lost out to a single late goal this afternoon to suffer a poor home result against an average Division One side. The visitors, the side previously known as Wimbledon, scored the only goal of the game in injury time. The visitor's goal was a well worked goal with a great finish - something Reading failed to come up with themselves despite having most of the possession throughout the game. The first half saw few efforts, but the game came to life during the second half with both sides having chances to take the lead. Hahnemann pulled off an excellent save from a close range shot to keep the game goalless, meanwhile Jamie Cureton had a header tipped over the bar and Rougier had a certain penalty denied after being taken out in the penalty area. Reading failed to create enough opportunities as the game went on and Wimbledon were always likely to grab one on the break - which was how they eventually won the game. Reading took another beating from lower league opposition in a cup competition, to exit the League Cup at the first round tonight. Reading were well beaten by Cambridge United who are a full two divisions below the Royals. The Royals were never really in the game with Cambridge looking the better side throughout to claim a straight forward 3-1 victory at the Abbey Ground. Reading started off at a slow pace allowing Cambridge to immediately take the upper hand. The home side took a 2-0 lead in the first half with two headed goals after free-kicks. After the break Reading immediately made a triple substitution as Pardew experimented with some bizzare tactics - but it made no difference with Cambridge adding a third. Matthew Upson made his full debut for the Royals in defence and scored Reading's consolation goal in the last minute - but Reading never threatened to get close to a fight back. Thankfully this poor performance was in the League Cup rather than the League. Back to winning ways on Saturday we hope! Reading improved their Division One record even further this weekend with a third straight clean sheet. The Royals followed up their run of two straight wins with an excellent result at fourth-placed Rotherham. The 0-0 draw saw Reading increase their points tally to 10 from the opening 7 games, and the point was enough to lift Reading to eighth in the table - the highest the Royals have been all season. It was another encouraging performance from the Royals who deserved the point but could easy have taken all three with Forster, Butler and Cureton all so nearly putting Reading ahead. Down the other end we had poor finishing to thank for Rotherham failing to steal the full three points themselves. 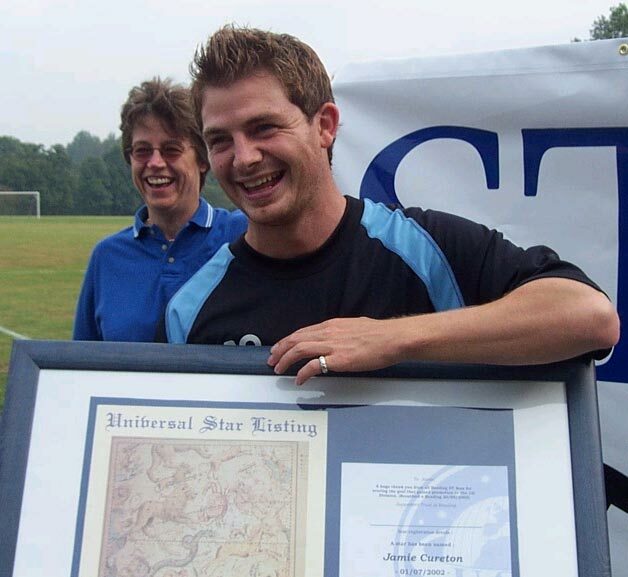 STAR today presented Jamie Cureton with a certificate and star chart recording the fact that a star in the constellation "Perseus" has been named after him: "Jamie Cureton". STAR (Supporters Trust at Reading) is the new official supporters body and was looking for a unique way of launching the STAR name, and to honour Jamie's goal against Brentford that clinched promotion to Division One. A permanent fixture in the heavens seemed ideal. The constellation was chosen because Perseus was a Greek hero, and Reading FC has no greater hero at present than Jamie, already off to a great start and leading the First Division goalscorers already this season with six. The star was registered via the internet and a copy of the entry is deposited at The British Library. 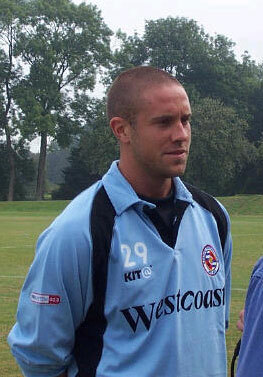 Reading have, today, completed the three month loan signing of defender Matthew Upson from Premiership Arsenal. Upson is a member of the first team squad at Highbury and arrives at Reading to help out in the centre of defence, where we've suffered a few problems so far this season. Upson is likely to step straight into the starting line-up on Saturday as the Royals travel to fifth placed Rotherham in what is certain to be a very difficult fixture. Upson, although still just 23 years old, has had an impressive football career after signing for Arsenal in 1997 from Luton Town for a huge two million pounds - despite only making two first team appearances for the Hatters. At Arsenal, Upson has regularly appeared in the starting line-up - making twenty Premier League starts out of his 56 first team appearances for the Gunners. There's doubt his signing is an impressive achievement for the Royals - even if only on loan. Upson has also enjoyed loan spells at Crystal Palace and Nottingham Forest, although his likely appearance for Reading on Saturday will be his first taste of first team action this season. Meanwhile, Adrian Viveash will continue to persue opportunities away from Reading with an even more limited chance of making the starting eleven. Reading took revenge for their play-off defeat at the hands of Walsall two seasons ago, with an impressive 2-0 away victory this afternoon. Reading's first away win of the season pushed the Royals well into the top half of the First Division table with three wins from the first six fixtures. Andy Hughes scored both of Reading's goals after an impressive second half performance that nearly saw him claim a hat-trick. Salako provided the crosses for both of the goals that saw Reading take the lead with twelve minutes left to play and seal the victory with the second in injury time at the end of the second half. Walsall had perhaps had slightly the better of the play during the first half, but Reading stepped up a gear in the second half to look the better side despite playing away from home. Jamie Cureton scored another two Division One goals tonight to set Reading on their way to a convincing 3-0 victory over bottom side Burnley at the Madejski Stadium. A decent mid-week crowd of just over 12,000 saw Cureton score two second half goals, either side of Martin Butler getting off the mark with his first of the season. This was a convincing victory for the Royals who were the better side throughout the match. Reading should have been ahead before the break with plenty of opportunities to take the lead but the win was sealed after Cureton put Reading ahead on 55 minutes. Butler scored a goal on the break with four minutes left to play and Cureton scored his sixth, and best, goal of the season with a fantastic lob of the goalkeeper in injury time. Reading will be looking for a good home win tomorrow night as they face bottom side Burnley at the Madejski Stadium. After today's results the Royals have a chance to climb back into the top half of the Division One table with a big home win. A win could see Reading go as high as 11th place in the table - although they could be edged lower on goal difference. On the other hand, a home defeat could see the Royals end Tuesday night just one place off the bottom of the table. Burnley have suffered three straight defeats from their three league fixtures so far this season and conceeded seven goals in the process. Today's results saw Portsmouth go top of the table and Rotherham claim second place. There were suprise defeats for Ipswich, Coventry and Derby. Reading lost out again at Leicester this weekend with a 1-2 defeat at the Walkers Stadium. It was another promising performance from the Royals who certainly don't look out of place in this Division - despite this being their third defeat from four Division One fixtures. A disasterous opening five minutes were enough to condemn Reading to defeat with a goal after three minutes being following up by a penalty to Leicester just two minutes later. Reading could never come back from going two goals behind so early on, but worked hard to get back into the game. Jamie Cureton made it 1-2 from the penalty spot mid-way through the first half with his fourth goal of the season. However the Royals couldn't find the equaliser. Reading will look to Tuesday night and the opportunity to beat bottom side Burnley at the Madejski Stadium. Reading failed to hold onto a first half lead this afternoon at the Madejski Stadium, and ended up going down 1-2 to visitor's Coventry City in front of nearly 15,000 fans. Coventry scored two goals in the last sixteen minutes to take home all the points - condemning Reading to their second defeat in three Division One fixtures. Reading looked good for at least a point throughout the game and seemed set to take victory until City eventually got the better of the Reading defence. Despite the disappointing final score-line this was another promising performance from the Royals after taking a one goal lead into the half time break. Jamie Cureton scored his third goal of the season from the penalty spot after a clear hand ball on thirteen minutes. Cureton had Reading's best chances of the first half. Meanwhile Whitehead was back in good form to keep Reading ahead - tipping a shot over just after City had hit the Reading post. The second half saw Reading hold out until 74 minutes on the clock when a free kick from the right was headed home in the middle. It was 1-2 just seven minutes later when Coventry broke from their own half and worked a quick ball into the box with the Reading defence well beaten. Butler had a late chance to make it 2-2 - but his shot flew well over the crossbar. Goalkeeper Marcus Hahnemann has today fully completed his signing to Reading Football Club on a free transfer. Hahnemann signs a new two year contract with the Royals after failing to renew his contract with Fulham. Marcus joined Fulham in the summer of 1999 for a fee of �80,000 from Colorado Rapids, but was restricted to just a handful of appearances after moving to England. He enjoyed a successful loan spell at Rochdale before arriving at Reading on loan in December of last year as cover for the injured Whitehead. Hahnemann made six league appearances for the Royals in an impressive loan period in which he conceeded just three goals and kept four consecutive clean sheets. He'll be looking to continue that form for Reading in Division One this season and is expected to take the goalkeeper's shirt from Phil Whitehead for Saturday's visit of Coventry City to the Madejski Stadium. Competition is sure to be tight between the two goalkeepers with Ashdown unlikely to get a look in. Jamie Cureton played a full ninety minutes tonight, and rewarded Pardew for his inclusion with two second half goals to give the Royals a home victory over Sheffield Wednesday. Cureton's two strikes were the first Division One Reading goals to be scored at the Madejski Stadium. However the first Division One goal at the Madejski belonged to the visitors who took a 0-1 lead with them into the half time break. In a real roller-coaster match, Reading dominated the opening period only to see Sheffield Wednesday score against the run of play. Wednesday could have easily stretched their lead before half time with a series of chances against a shakey Reading defence. The replacement of Harper with the impressive Igoe turned the game back around as the Royals regained their composure to start the second half with a goal. Cureton connected with Hughes' cross to put Reading level. It could have been two shortly after when Salako should have scored, but it was two with twelve minutes left with a near copy of the first Reading goal - Hughes supplying Cureton once again. There was still time for a Wednesday fight back as Reading hung on for their first full three points of the season. Reading were well beaten on the opening day of the Division One season - going down 0-3 at Pride Park against an impressive Derby County this afternoon. This was far from the dream start we were hoping for, and instead was a tough reminder of the quality of teams Reading will face during the new season. But it wasn't all bad news as a near capacity crowd of over 33,000, including strong away support, saw the Royals hold the home side to 0-0 at the break. Reading had some good periods during the first half and played a tight defensive game to restrict Derby County to just a few chances. After the half time break County appeared to step up a gear and looked a class above the Royals who struggled to contain the Derby attack. Derby could have been two up just a few minutes into the half when Whitehead made a great reaction save, followed by Watson clearing off the line from a corner. A change in Reading's formation with the introduction of Cureton appeared to trigger the breakthrough for County who took the lead on the hour. The second goal, just moments later, was a repeat with Derby walking through the Reading defence and creating the chances with a couple of quick passes and scoring from well within the box. The game was wrapped up with 18 minutes left to play with another fast passing movement from the other side of the pitch giving Whitehead no chance as the defence was made to look weak against a superior attack. Cureton had a late effort for the Royals which was well wide - but it was a rare attempt on goal. Reading's new season in Division One kicks off tomorrow with a visit to the Pride Park Stadium where the Royals will take on newly-relegated Derby County. County obviously have a strong side and will be looking to start the season with a home win as they attempt to bounce back into the Premiership. Reading's last Division One game was way back in May 1998 when a capacity Elm Park crowd saw Reading losing out 0-1 to Norwich City. Despite no real changes to the squad in the close season, Reading will be looking to make a positive start to the new season and bidding to end the run of draws that completed the Division Two campaign. There should be close to 4,000 Reading fans at Derby to support the Royals, and Derby's kid-for-a-quid scheme for thier opening game will guarantee a massive turn out. Full details from Tuesday night's fans' forum are now available on Hob Nob Anyone? The forum, held by STAR (the body that replaces the Reading FC Supporters' Club this season), took place at the Madesjki Stadium and saw John Madejski, Alan Pardew, Kevin Dillon, Nigel Howe, and Boyd Butler from the club take questions from the fans. Questions centred on the new season that's about to kick-off with plenty of questions directed to Alan Pardew about team members. When asked about the new season, Pardew predicted a top ten finish for the Royals. I think all Reading fans would be very happy with that! For full details of this week's meeting between the fans and the club please click below to read the full article. Reading's impressive pre-season programme came to an end tonight with an excellent 5-4 victory over Premiership West Ham United at the Madejski Stadium. The victory was Reading's seventh from the nine pre-season fixtures, with the only defeat coming at home last week against Charlton Athletic. The Royals can now look forward to the season ahead after seeing plenty of promising signs to show we're capable of doing something in Division One this season. Tonight's game was a great way to finish before the season kicks off at relegated Derby County on Saturday. Another low crowd of just over 7,000, saw Reading outplay West Ham United to take a deserved win after fighting back from two goals down. The visitors went 0-2 up after twenty five minutes, only to see Reading hit back with an amazing five goals in a row to go 5-2 up. Cureton grabbed the Royals first from a free-kick, and the impressive Darius Henderson made it 2-2 after scoring from his rebounded effort. Parkinson made it 3-2 and Rougier supplied the cross that saw Cureton score his second from close range, to make it 4-2 at half time. Cureton completed his hat-trick from the penalty spot before West Ham fought back later in the game to make the score respectable with two goals after several stoppages for mass substitutions. The nine goal spectacular, with Reading claiming the win, would have made it value for money for those that turned up - but the real test comes on Saturday. Fans voted with their feet on Friday night as a hugely disappointing crowd of 3,054 turned up to watch Reading play Premiership Charlton Athletic in a pre-season friendly at the Madejski Stadium. The game was massively over priced, with tickets on the day of the game costing �20 for the non-competitive fixture. The same prices apply for tonight's friendly game against West Ham United at the Madejski Stadium. Last season 21,874 fans turned up to watch Reading play Tottehnam in a pre-season game at the Madejski (tickets were priced at �10 in advance or �14 on the night for that game). Tonight's game against Premiership West Ham United seems unlikely to generate a crowd even close to that figure. Friday's fixture saw a reasonably entertaining night, despite the low turn-out, with Reading losing out in a seven goal game. Reading can take a lot from their impressive performance after going down 3-4 to Charlton who scored an injury time winner. The game was mostly played in a friendly manner at a friendly pace, with the exception of a couple of hectic moments and the last fifteen minutes of the game when things threatened to get competitive with a couple of rough challenges. Reading took the lead in the opening five minutes when Forster scored from a Salako cross that was played on by Butler. Charlton scored two before the break to go in 1-2 up at half-time. Reading stepped up the pace after the break and equalised when Igoe crossed to Harper inside the box, who fired home. The away side promptly pulled ahead again until Alex Smith scored the goal of the game to make it 3-3 with a superb free-kick from the edge of the box. Charlton eventually grabbed the win, right at the end, firing home past Ashdown in the Reading goal. Reading failed to win for the first time during the pre-season build up yesterday with a goalless draw in Germany against SSV Reutlingen. The game completed Reading's summer tour of Germany, and the side will now return to face Charlton Athletic and West Ham United in the remaining two friendlies before the new season kicks-off. Hob Nob Anyone? is now on pre-season holiday, so we won't be bringing you reports on the two over-priced home friendly fixtures. We will of course return with full coverage of the new season with full reports and opinions from Derby. In the meantime please check out the discussion boards for the latest fans opinions on the Royals. Reading central defender Adrian Viveash could miss the start of the season after picking up a hamstring injury during pre-season training. It's not known how bad the injury is, but it's likely that it will put Viveash out of action for a few weeks - which could make him doubtful for the trip to Derby on the 10th of August when the season kicks off. Viveash missed a couple of months of action in the middle of last season but became a regular during the end of season run in. Apart from Viveash, Reading should start the season with a fit squad ready for the Division One campaign - with a number of key players that missed the majority of last season fully restored from injury. Reading kicked-off their German tour with an impressive 6-0 victory against TSV Krombach this evening. TSV Krombach may be round-about Conference standards or below, but the Royals will obviously be pleased to find the net six times away from home in the warm-up to the new season. Cureton put Reading 1-0 up before the break and the Royals managed a further five goals in the second half with Henderson finding the net, Hughes scoring two, Whitbread scoring, and Cureton getting his second from the penalty spot. One concern was the substitution of Bas Savage with an apparant knee problem. Reading have been drawn away at Third Division Cambridge United in the first round of the League Cup. The game will take place on Tuesday 10 September with a 7:45pm kick-off at the Abbey Stadium. The Royals will be looking to improve their history in cup competitions against Cambridge. The last time the two sides met in a cup competition was in the FA Cup during the 1993/1994 season when Reading drew 0-0 at Cambridge only to lose the replay 1-2 at home. Two seasons before that Reading met United in the League Cup and suffered even worse mis-fortune, going down 0-1 at home in the first leg and then being beaten 0-3 away from home. The Hob Nob Anyone? squad guide for the new season is now available. The first team squad for the 2002/2003 season sees the inclusion of Academy players Steve Warren (who takes the number 28 shirt for the new season), and midfielder Andre Boucaud (who will wear number 23). Other changes from this time last year includes the addition of striker Bas Savage who claims the number 20 shirt. Players missing from last season's squad are Keith Jones, Neil Smith, and Matt Robinson who failed to have their contracts renewed during the close season. The only other changes from the squad that began the 2001/2002 season are players that signed during last season's Division Two campaign - Kevin Watson and John Salako, who both signed during 2002. It seems the squad list is unlikely to dramatically change between now and the start of the new season with no new signings on the horizon. STAR is the Supporters Trust At Reading. It's the successor to Reading Football Supporters' Club and aims to do all that the Supporters' Club did - and more. STAR seeks to encourage support for Reading FC, acquire and hold shares in the club on behalf of supporters, promote constructive involvement of supporters in the club and continue the work of RFSC. Membership of STAR also includes the following benefits: Money off in the megastore, access to Fans' Forums, and ticket priority for away fixtures. Last season (2001/2002) nearly 2000 Reading fans joined the Supporters' Club - STAR aims to build on that number for 2002/03. To become a member of STAR you can apply now using the application form provided from the link below. Please follow this link, during STAR's initial season, for a unique offer to become a founder member of STAR which includes additional founder member benefits. Reading continued their run of pre-season friendly wins with a 4-2 away victory at Kidderminster last night. The game was a good exercise for the Royals with a first team line up playing together against a strong home side. The first half wasn't too much to get excited about despite four goals before the break. Reading took the lead from a superb Nicky Forster effort, only for the home side to pull level after some poor Reading defending, and then go 1-2 up with the best goal of the night. Just before the break the Royals were level when a Forster cross was put into the net for an own goal under pressure from Martin Butler. The second half saw Reading look a much better side with Martin Butler looking impressive up front. Butler got on the score sheet to make it 3-2 with a clear run on goal, and then crossed to Salako later in the half for a close range goal to make it 4-2 at full time. There were no serious injury concerns on the night, despite Viveash being substituted after taking a knock. Reading Team: Whitehead, Murty, Viveash, Williams, Salako, Watson, Harper, Igoe, Butler, Forster, Rougier. Subs: Parkinson, Savage, Alex Smith, Cureton, Hughes. Tickets for the first game of the new Division One season, away at Derby County, go on sale from next Wednesday (24 July) to season ticket holders. Remaining tickets, from Reading's initial allocation of just over 3,000, go on sale to RFSC members from the following Monday and then go on general sale the following day (Tuesday 30 July). Reading's trip to Derby County, relegated from the Premiership at the end of last season, is sure to attracy plenty of interest. The attendance should be boosted by Derby's decision to make the game "kids for a quid" - a deal that also applies to visiting Reading fans. Meanwhile, adult prices are �20, and OAP prices are �10. Hob Nob Anyone? featured in Sport First newspaper this week with an article previewing Reading's 2002/2003 season ahead. The article was the main feature in the First Division area of the paper and commented on the success of last season and the tough season the Royals face in a higher Division. So far Reading have released three players (Keith Jones, Neil Smith, and Matt Robinson) and failed to sign any replacements with the new season less than a month away. The lack of funds has meant that Reading are yet to strengthen the squad into the new season, despite dramatic increases in ticket prices - and some areas of the official website becoming pay-per-view this week. Sport First is a weekly national sports newspaper, published each Sunday. The current issue, which features this article, should be available in newsagents now. Reading struck up two more pre-season friendly victories this afternoon as the first team squad split into two and played fixtures at Whyteleafe and Banbury United. Both games kicked off at 3:00pm and saw Reading win without conceeding a goal and giving appearances to a number of fringe and regular first teamers. First half goals from John Salako and Martin Butler earnt a 2-0 victory at Whyteleafe. Meanwhile a single first half goal from Nicky Forster was enough at Banbury for a 1-0 win. Reading started their pre-season build up with two victories in friendly matches last night. The first team squad split into two to travel to Oxford City and Basingstoke Town for evening games. At Basingstoke goals from John Salako, fringe players Stephen Laidler and Steve Warren, were enough to give the Royals a 3-1 victory with a decent second half showing from Reading under the old Elm Park floodlights. Meanwhile at Oxford City, Reading were 3-2 winners with the home side twice pulling level before Reading sealed the win in the second half. Nicky Forster grabbed two goals with Andy Hughes scoring the other for Reading on the night. With no serious injuries to report it appears to be a successful opening night for the Royals - in which the run of draws finally came to an end! Reading kick-off their pre-season campaign tonight with visits to Basingstoke Town and Oxford City for friendly fixtures. The first team squad will split between the two matches giving virtually the entire squad, plus fringe players, a game. Last year's Player of the season Graeme Murty will be joined by Adrian Whitbread, Phil Parkinson, Ricky Newman (who returns from last season's injury problems), James Harper, and Martin Butler for a strong line-up at Basingstoke. Meanwhile Phil Whitehead, Adrian Viveash, Andy Hughes, Nicky Shorey, Tony Rougier, Nicky Forster and Jamie Cureton should make appreances at Oxford City. Reading fans wishing to attend either game can pay on the gate tonight - adult tickets are �7 at Basingstoke and �5 at Oxford. Reading Football Club have announced ticket prices for the August friendlies at the Madejski Stadium against Charlton Athletic and West Ham United. Tickets for the games will be available from Monday. Both games are priced the same, with adult tickets bought in advance over the telephone selling at a rather large sixteen pounds (fifteen pounds plus one pound 'booking fee' per ticket). Internet purchases, through the 'official website', are priced at �14 (�13 plus a �1 booking fee). The best bet is to buy in person in the ticket office for �15 and have the option of picking your seat if you plan to sit in a reserved seating area. If you fancied just turning up on the day then you're in for a very unpleasant suprise - match day tickets cost �20! For a friendly! Blimey. With a series of decent sides visiting the Madejski this season in competitive matches, many fans may decide to hold out until the new season kicks-off rather than turn up to see an expensive friendly against non-glamourous Premiership opposition.